Canine lung cancer symptoms occur much more often in older dogs than younger dogs. The reason for the high incidence in older dogs is that lung cancer in dogs may spread slowly, and also a lack of recognition among owners of early canine lung cancer symptoms. Lung cancer usually originates from the apex of the bronchi or alveoli. Adenocarcinoma (cancer at the periphery of the lungs) and anaplastic carcinomas are the most commonly classified types of cancer in dogs. While adenomas and lung sarcomas, which are primary lung cancers, occur with a lower level of frequency. The prognosis is variable for each case, depending upon nature & status of the lung cancer. Treatment involves surgical resection (partial removal) using a procedure called a obectomy. Chemotherapy is preferred to prevent the spreading of the cancer. Death usually occurs due to a metastasis (spreading) of cancer cells to other parts of the respiratory system and to other vital organs of body. 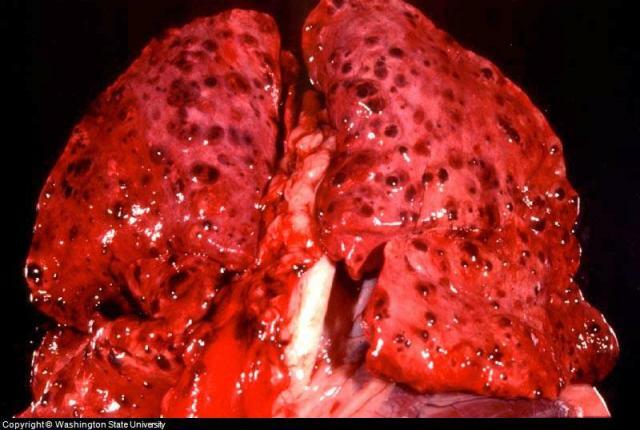 Primary lung cancers in dogs (cancer that originates in the lungs) are mostly metastatic i.e. they have a capacity to spread in other parts of body. Adenocarcinomas & anaplastic carcinoma are the most common types. On the other hand adenomas and sarcomas, occur less frequently. Cancerous cells can spread to other parts of lungs, surrounding lymph nodes, bones and even the brain. These canine lung cancer symptoms are non-specific (they indicate diseases other than dog lung cancer) and depends upon the type of cancer, growth rate and owners awareness towards lung cancer. Lameness for example occurs during the later stages of lung cancer, such as when the metastatic form of cancer spreads to the brain and bones. In most cases, canine lung cancer is diagnosed during radiography (x-ray) for other problems or at necropsy (Post Mortem examination to determine cause of death). Thoracic radiographs can show lesions at the alveolar sac, diffused lung cells or a lobar fusion, thus a tentative diagnosis can only be predicted for canine lung cancer. For a confirmed diagnosis, a biopsy is usually carried out. If the canine lung cancer exists as what is known as a lobar fusion, surgical removal of diseased lung lobes by a lobectomy is the only effective treatment,. Metastatic or those cellular growths which can not be operated surgically can be controlled by chemotherapy. Anti-cancer drugs are helpful & effective in most cases. The dose scheme has to be defined prior to administration and may have side effects such as pain, vomiting, hair loss and even secondary cancerous cell growth. Recovery can only be noted after 15 – 26 months of treatment if only the lungs were involved. Dogs that have surrounding lymph node involvement or multiple tumors usually do not survive or have very short survival times. Death mostly occurs in treated dogs due to metastasis (cancer spreading)& recurrence of lung cancer. For added dog lung cancer support there is a homeopathic supplement available called C-Caps Formula. While homeopathic remedies are not a cure for cancer, they do contain ingredients that have a history of helping the body fight cancer cells such as natural anti-oxidants. The company is also a good source of additional research on cancer in dogs.